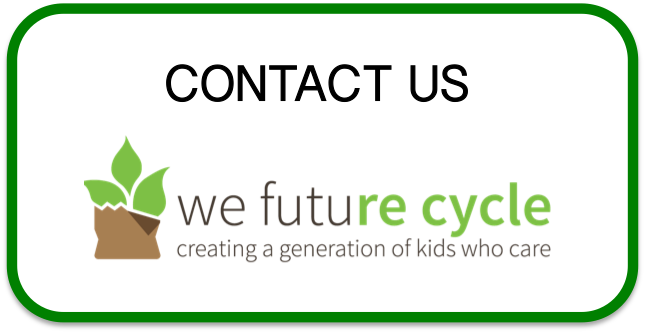 Rye School district is successfully implementing the We Future Cycle Recycling program in all aspects of school life. Each elementary school is diverting 95% of its waste into composting and recycling streams with students being enthusiastic partners in this program. Osborn’s PTO just organized a fabulous “Scare Fair” and of course implemented the sorting program into that event. Despite the weather, there were wall to wall people enjoying the fun entertainment and the wonderful choices for food. Food was contained to the lunchroom and 3 recycling stations were set up and monitored to allow for waste diversion, the same way the students are doing it every day. Consistency is an important factor for long term learning. We Future Cycle representatives were on hand to supervise the sorting stations and use that opportunity to share information with parents and other fair participants. Most parents had heard from their youngsters about the program and were eager have their kids model what needed to be done. We shared data and background information with parents and other fair participants and most were quite astonished to learn just HOW much was diverted and the cost of garbage in general. The Osborn Scare Fair diverted about 200 lbs of food waste into compost, about 8 large bags of commingled into recycling and only 2 bags were non recyclable items that made it into the trash. Custodial staff estimates a 90-95% reduction of garbage through diversion. What most people do not realize. When we divert materials from the garbage, not ONLY do we ELIMINATE the emissions associated with the burning of that trash, we are also RETAINING the resources. Can you image what it could mean if the entire country was to divert 90-95% of its waste into composting and recycling? Definitely something to strive for, and so easy to do. Just separate your waste! Done. Ask these kids, they do it every day, without even thinking twice about it now. “It smells just like wet forest” Trinity K students learn how to sort their waste and what compost is. New Rochelle Trinity Elementary School is entering its 5th year running the We Future Cycle recycling program and students are getting trained on how to sort their lunch waste into compost, recyclables and trash. Like every year, We Future Cycle presenters swoop upon the school and go from classroom to classroom to playfully introduce the students to the concept of recycling and to the problems attached to garbage. All students start out considering anything empty as garbage. Upon asking if they thought I brought them recycling, they clearly were reconsidering their position and some raised their hands. And they were quite astonished to learn that I just brought them packaging material, and they decided if that became garbage or recycling. It was fascinating to watch how something shifted inside them. THEY decided on something as important as putting something in recycling. The We Future Cycle Recycling program teaches children to separate recyclable material from food and non recyclable material, and this reduces garbage by a whopping 97%. Trinity is consistently at below 6 lbs of trash from the entire lunch of nearly 1000 students. Students learned that packaging is similar to Lego. If is put into the correct bin, it can be taken apart again and the same material blocks can be used to build something new. Students totally get that concept! Learning that left over food can be recycled too was a bit of a stretch for them, but when I showed them what compost looked like and let them smell it, they all agreed that it is much better to make good soil than burn our banana peel. This is the gym of the New Rochelle Davis Elementary school. Beautifully decorated thanks to the tireless PTA. The entire school was buzzing with the excitement of the International Dinner. Hallways walls were floor to ceiling decorated with the artwork of students depicting traditional things of their homes. Tables weighed down with delicious foods of all corners of this earth lined the perimeter of the gym and in the middle of this all was one recycling station. Not tons of trash cans as it is often the case for these events. Davis Elementary school under the leadership of Anthony Brambola and Laurie Marinaro have fully embraced going green and are actively supporting bringing recycling to all school events. And parents had the chance to sort their waste just like their kids do every day. It was very charming seeing a Kindergarten student pulling mom behind her to explain carefully what item goes in what bin. And then she declared with a smile that mom now saved the world! Yes, every one can save the world, one every day activity at a time. Parents needed a bit of encouragement to actually look at the signage, which clearly outlined where recyclables, compostables and trash needed to be placed. But of course, once they got it, they were enthusiastic about it. Davis Elementary School is a shining example of how a whole community can be educated to become green..